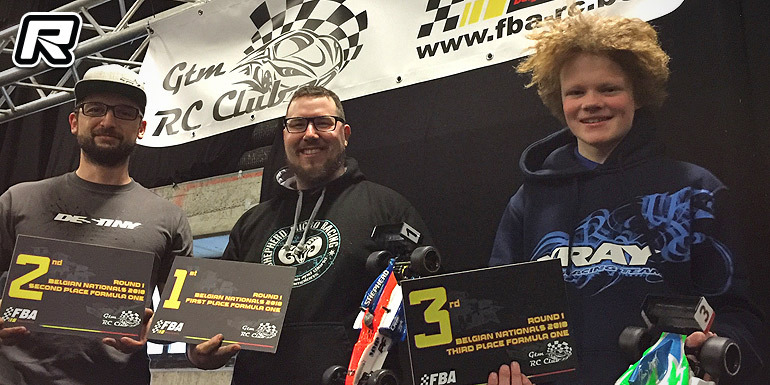 Round one of seven of the Belgian FBA 1/10th Electric On-road National Championship was held this past weekend at the GTM club in Vosselaar. The club laid out a technical layout on the 30x20m ETS carpet track with a roomy pit area allowed lots of space for drivers and mechanics. The 2-day event kicked off with open practice on Saturday while the qualifiers and finals would be held on Sunday. Classes run remain the same for 2018 with Touring Modified on Voltante 28 tyres, Touring Stock using the ETS motor and speedo combo and Volante 28 tyres, Formula with ETS combo and Voltage tyres as well as the 17.5T fixed timing Rookie class. The race format for the weekend would be three rounds of qualifying followed by triple mains for all. The Touring Modified class saw Olivier Bultynck (Awesomatix) ran like a Swiss watch in the qualifiers, setting almost identical times in the three sessions and improving the track record at each run. His nearest challenger was Dutch driver Mitchell Van Es (Awesomatix) who also recorded three impressive runs. Nicolas Delisé recently switched to Destiny and he claimed a fine 3rd position. Just like Olly and Krist, Nicolas and his dad Stéphane are a great team, with Stéphane preparing the Formula car so that Nico could concentrate on his touring car. Florian Joos had to start from the second group, but despite of this claimed a nice P4 position, two seconds behind Nico. Steve Lambrechts, the former multiple Belgian champion, claimed P5 with his Xray. In the finals Olly took A1 in style, in front of Mitchell, who drove an equally impressive race, despite not using an aluminium chassis. Nicolas’ car was understeering, and he had his hands full to counter the attacks of Florian, who was under attack from Steve. Both of them tried to find a gap, but Nico kept every door shut and claimed P3 in front of Florian and Steve. A2 then was a copy of A1, with Olly checking out early and Mitchell upping his game to stay in touch. Mitchell improved upon his A1 time, but he couldn’t prevent Olly from winning. Nicolas was again challenged by Florian for P3, but the youngster couldn’t find a gap. Athan De Witte (Yokomo) claimed a fine 5th position after a blindingly quick start when he disposed of Steve. For A3 Olly could sit back and relax to check out who would accompany him on the podium. Mitchell took the holeshot, but Florian had to be on his toes not to hit Nicolas at the start. Athan again made a rocket start and took P3 starting from P5. Florian could retake P3 but Athan attacked him back. The two youngsters could find overtaking spots where no one thought them to be while keeping in contact with Nicolas. When Florian touched Nicolas while trying to take P2, Athan and Steve stormed by. Athan tried to claw down Mitchell, but ran out of time. 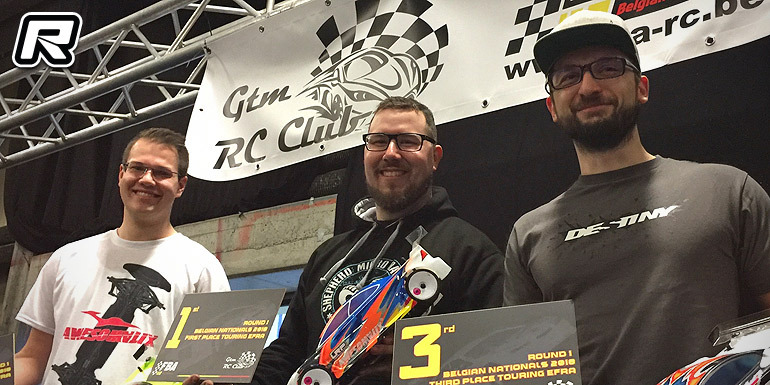 The overall ranking was Oliver Bultynck (Awesomatix), Mitchell Van Es (Awesomatix), Nicolas Delisé (Destiny), Athan De Witte (Yokomo) and Florian Joos (Xray). Steve Lambrechts finished in P6, but he was in the mix for the fight for 3rd place. After a fantastic racing career, Steve was forced to take a long revalidation, but he is working hard to get back to the top. 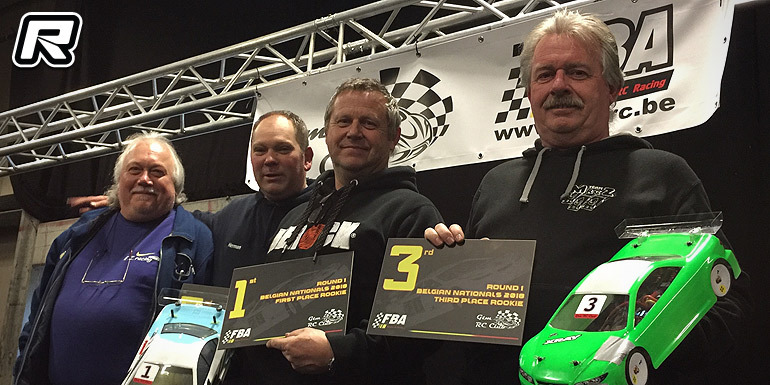 With the promotion of Stefan Rommens and Florian Joos to the Modified class, some said that the Stock class was a bit beheaded. 2017 champion Vincent Van Gansen was however keen to keep his title. The main challenge would come from Giovanni Moguez (Xray). Giovanni has been training intensively the last months and is at his prime. Unsurprisingly the first qualifier went Vincent’s way, but Giovanni was only 0.6 seconds behind after the full five minutes of intensive racing. The battle for TQ would go down to Q3. Vincent however kept his cool and claimed his first pole of the season. Giovanni lined up 2nd, but was only one second behind. Rick van den Akker (Xray) took a fine third position, some six seconds behind Giovanni. Having not run in last years championship, Rick had to start in the slowest group, which hampered his pace a bit. Xavier Debroye put his Awesomatix in 4th, followed by the Infinity of Peter Degrande. Perhaps the biggest surprise was the great pace that youngsters Alexander Van Gansen (Tamiya, P7), Mathias van Laere (VBC, P8) and Roel Jongenelis (P10) showed. Vincent doesn’t seem to like thrillers, and he upped his game for the finals. He controlled the entire field and easily won A1 and A2 in great fashion. He thus claimed his first race of the season. Giovanni Moguez took the runner up spot and thought his lack of pace in the finals to be down to tyres as in stock, only 1 set of tyres is allowed). Rick finished a solitary 3rd and completed the Xray podium. Xavier Debroye put his Awesomatix in a fine 4th postion, followed by Pasquinel Neys (Team Magic). The youngsters Alexander, Mathias and Roel finished in 8th, 9th and 10th position respectively. The three of them showed great racecraft, with Alexander running as high up as 4th in A1 before his ESC went into thermal protection. Thanks to a strong contingent of Dutch drivers, the Formula class was the biggest of the first nationals. The field of was spearheaded by the Belgian ace Olivier Bultynck (Shepherd), but the regular ETS A-main finalist Nicolas Delisé and Steve Deblaere were out to challenge Ollie. New for 2018 are the 8-minutes qualifying and final runs, and this would give some exciting battles. In qualifying, Ollie showed the field who things need to be done, and he TQ’d the event, some five seconds in front of Nicolas’ Roche. Nicolas was however challenged by Florian Joos (Xray), Steve Deblaere (Serpent) and Vincent Van Gansen (Xray) who were within two seconds of each other. Martijn Van der Heijden (Fenix) was not far off in 6th either. In A1, Ollie wanted to check out early, but Nicolas was keen to follow his pace. Until lap 12 the battle raged on, but then Ollie eased away. Both of them were having a solitary run, but the battled raged on for P3 to P5. Steve took P3 from Vincent and Florian after a battle that lasted for 10 laps. A2 again went Ollie’s way, but this time, Nicolas was hunted down by Florian for almost the entire race. When Florian did a daring move to gain P2, Nicolas fought back and reclaimed his position. The fight for P2 raged on till Nico traction-rolled his car on a piece of tape. Steve took P4 in front of Vincent who showed great pace in his rookie Formula year. Ollie elected not to run in A3 and watched the fight for the final podium spots from the spectator area. At the first corner melée, Martijn was hit for the third time and he pulled his car off the track. Unfortunately he cut the track to park his car and ran Florian off the track. Thanks to some quick marshalling, Florian kept P7 as he hurled down the peloton, led by Nicolas, Vincent, Steve and Patrick Jongenelis (Xray). When Florian was pushing Patrick for P3, Patrick decided not to fight back and decided to let Flo go by. In great sportsmanship, Vincent let his teammate go by so that he could try to catch Nicolas. Nicolas was however cruising and almost had the victory in his bag. Nico made an uncharacteristic mistake and this allowed Florian in his slipstream again. Nicolas withstood the pressure so Florian waited for the very last lap to try a pass. As it wasn’t a clean one, he waited for Nico to recover. The overall results were Olivier Bultynck (Shepherd), Nicolas Delisé (Roche), Florian Joos (Xray), Steve Deblaere (Serpent) and Vincent Van Gansen (Xray). Youngster Liam Van de Wouwer (Xray) took a fine 8th place in this strong field. 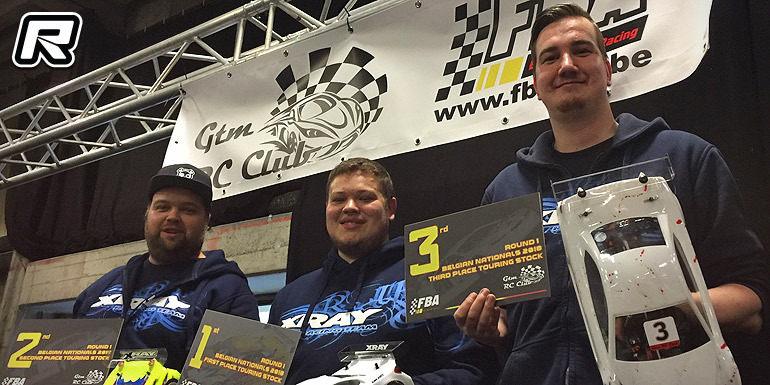 In the Rookie/senior class four entries battled for the win and in the end it was the Xray of youngster Luc Wauters who was in front of Herman Van Gansen (Tamiya), Rony Claeys (Xray) and Marc Joosens (Yokomo).